Psychology professor Jordan Peterson has risen in less than a year from an unknown if much-loved academic... to a world-class "rock star level" popular philosopher. Most of his avid following (to which I belong) discovers him through his courageous defense of free speech against SJW language-policing, but then eventually becomes hooked by his deep mind-bending work on archetypes and psychology. His precise time of birth is not yet in the public domain, but even without it we can glean some relevant aspects from his horoscope. Pallas square the lunar nodes: this should be no surprise if there is anyone out there familiar with both Peterson's work and my astrological explorations. 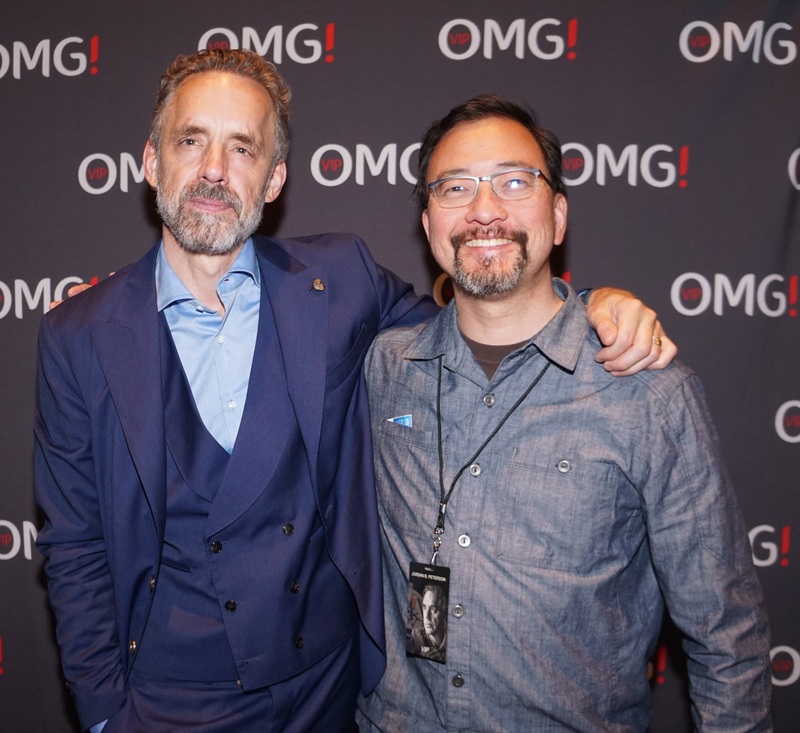 Peterson has spent most of his life exploring the roots and nature of ethics. In astrology, Pallas rules ethics (an assertion which most of this blog defends with examples) and the lunar nodes rule (in a manner of speaking) karma. In the whistleblower examples in this blog, we see that persons who become famous for growing to a level of higher ethical sophistication over time tend to have Pallas configured with the lunar nodes. Retrograde Mercury square Jupiter and Chiron: effective use of his own vulnerability (Chiron) in public (Jupiter) speaking (Mercury) about the past (retrograde). The Moon is probably also in this aspect pattern, for if he was born early in the day the Moon would be longitudinally in aspect to the pattern. If he was born around noon, then the Moon is parallel Chiron. 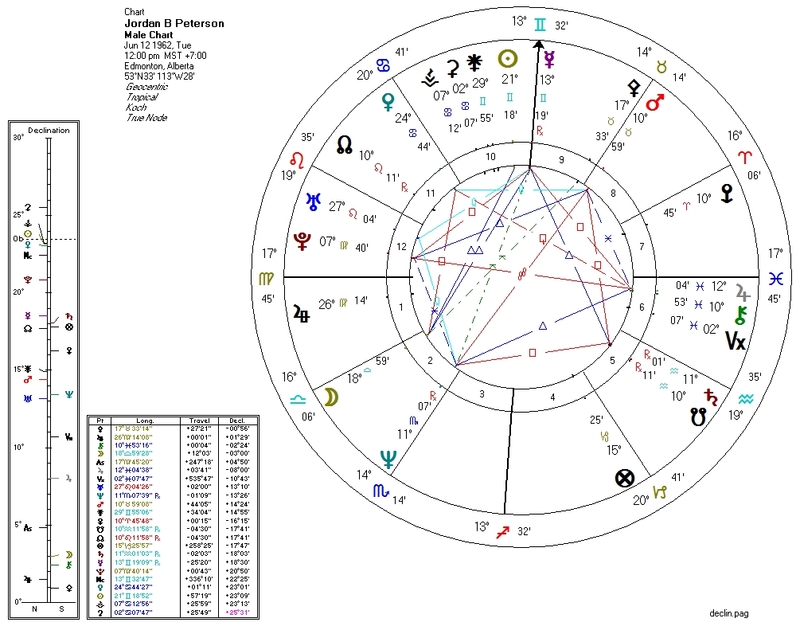 South Node conjunct Saturn opposite North Node in Leo: one of Peterson's recurring topics is the self-actualization of the son/child through a process of rescuing his father from death/past. Venus squine Neptune: Slight left-wing economic tendencies and heightened creativity. Mars in Taurus opposite Neptune in Scorpio: defending capitalism against Socialist power/deception. Mercury/Uranus/Neptune aspect triangle: speech plus rebellion, plus/versus socialism/deception. Mars/Pallas square Saturn/South-Node in Aquarius: ethical defense against regressive authoritarian social-justice-warriors. Neptune square the Nodes and Saturn: a very typical "atheist" configuration. Peterson deliberately does not describe himself as such, but interestingly enough defends Christianity using a highly novel and compelling Darwinist line of argument. This aspect pattern is also consistent with his non-belief in astrology. Here is an attempted rectification of Peterson's chart.